Release Date: May 12th, 2006 by Touchtone Pictures. The Cast: Kuno Becker, Alessandro Nivola, Stephen Dillane, Anna Friel, Marcel Iures, Sean Pertwee, Cassandra Bell, Kieron Dyer, Gary Lewis. BASIC PREMISE: Santiago, a Mexican-American living in Los Angeles, tries out for the Newcastle United soccer club in England. ENTERTAINMENT VALUE: Although full of clichés from start to finish, Goal! feels mildly entertaining thanks to the charms of its lead, Kuno Becker. If you’ve seen any sports movie about an underdog, this will all be familiar territory, but that doesn’t make it less enjoyable. Santiago gradually adjusts to his newfound fame in England after Glen (Dillane) a British agent, discovers him. 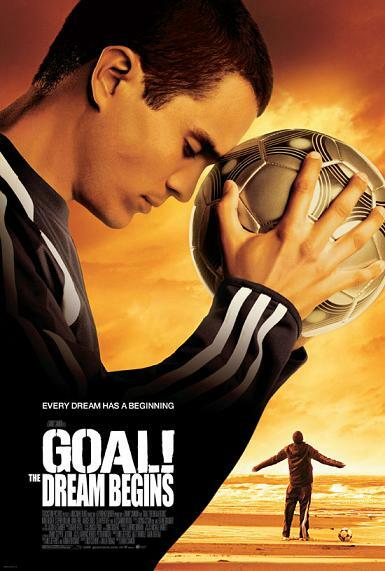 The main dramatic conflict is that Santiago plays soccer against his father’s wishes, so he now has a stronger drive to succeed, not just for his own happiness. It would have been more engaging if the screenplay had some comic relief—a few attempts for dry British humor fall flat. Unfortunately, the plot eventually wears too thin while relying too much on Becker’s charm. Danny Cannon’s directs with a fast pace and plenty of energy, but with a few awkward transitions between scenes. After the very predictable third act, Goal! fades from memory very quickly. SPIRITUAL VALUE: While the basic message about believing in yourself and never giving up sounds slightly corny, the ending does feel satisfying and uplifting. INSULT TO YOUR INTELLIGENCE: Too many clichés and a formulaic plot. IN A NUTSHELL: Mildly entertaining with many clichés and no surprises or humor in its formulaic script.